﻿ Philippians 4:4 Rejoice in the Lord always; again I will say, rejoice! Rejoice in Lord always. Again I will say, rejoice. Rejoice in [fellowship with] the Lord all the time. I will say it again: Rejoice! Rejoice in the Lord alway: I say it again, rejoice. Rejoice in the Lord always: I say to you again, Rejoice. Goodbye, and the Lord be with you always. Again I say, goodbye. Rejoice in the Lord always: again, I say, rejoice. 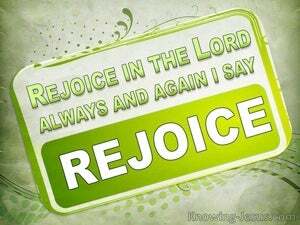 Rejoice in the Lord always: again say I, Do ye rejoice. Rejoice in the Lord alway, and again will I say, rejoice! 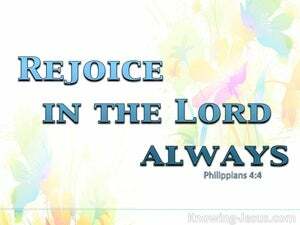 Rejoice in the Lord always. Again I will say, Rejoice. Rejoice in the Lord always; again I will say it, rejoice. Rejoice in the Lord always: again, I will say - rejoice! All joy be yours at all times in your union with the Lord. Again I repeat--All joy be yours. Always be glad in the Lord: I will repeat it, be glad. By the help of the Lord always keep up the glad spirit; yes, I will repeat it, keep up the glad spirit. 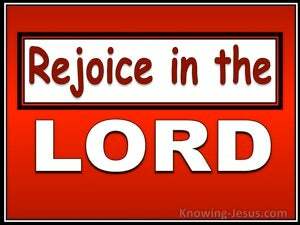 Rejoice in the Lord always! Again I will say, Rejoice! 3 Indeed, true companion, I ask you also to help these women who have shared my struggle in the cause of the gospel, together with Clement also and the rest of my fellow workers, whose names are in the book of life. 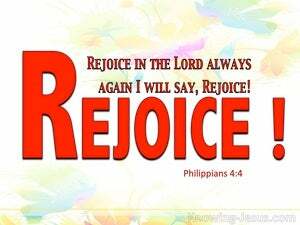 4 Rejoice in the Lord always; again I will say, rejoice! 5 Let your gentle spirit be known to all men. The Lord is near.